I love having things to look forward to. As a stay-at-home-mom, it’s these things that help get me through the day. It can be simple things like knowing we have a play date in the afternoon or even General Hospital signaling that the day is at its mid point. (I know, I know, I do like my GH). I’ve been planning my first half of 2014 race wise and I’m 6 races in through April. There are some races I’ve done before and new races I’m sooo excited to finally be able to do one being the Lost Dutchman in February. I was hoping to do the ½ marathon but this race is two weeks before my first full marathon. Even though my training plan calls for a long run around that distance, I didn’t want to do it at race pace. So, I signed up for the 10K. I’m still super excited about this race. It’s got a great reputation for its organization, scenic views, and overall atmosphere. Time related things I’m excited about: I’m looking forward to breaking 25 minutes in a 5K. I’m going to do it! I don’t do many 5K races so this will be something I’ll have to work on. I’m not a speedy person and 5Ks for me=speed. I’m excited about the challenge of completing a 1/2 marathon under 2 hours and most of all, I’m so, so, so excited about finishing my first full marathon in whatever time! 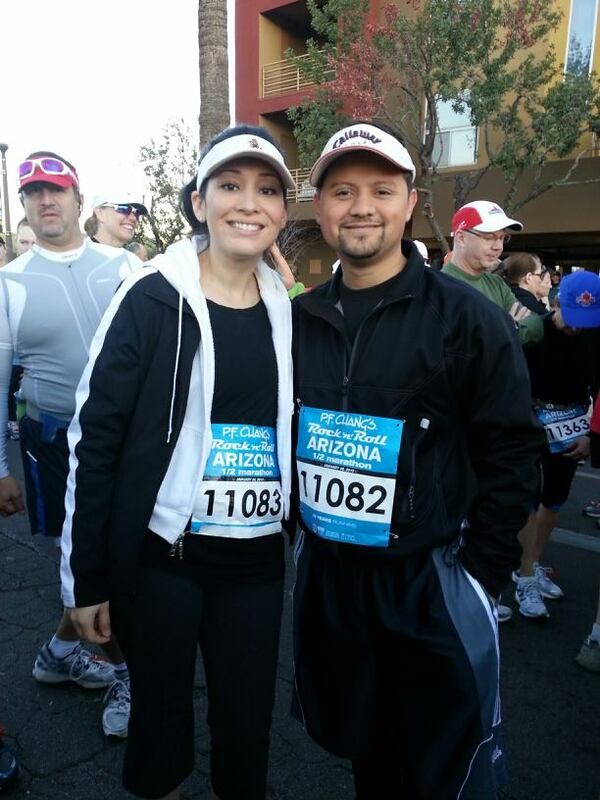 Finally, what I’m looking forward to the most is seeing my husband grow as a runner. He’s been doing some mini training for the ½ marathon we’re both doing mid-January. I’m so proud of how well he’s doing. He was a track guy in high school and never thought he’d ever do long distance. I love that he’s challenged himself and is working towards something outside his comfort zone—and doing awesome at it! I’m excited to see what his running future looks like this new year and in the future. I want to wish all of you a happy 2014 and I’m so excited to see what it brings you!! —What are you looking forward to in 2014? It’s crazy to think that the year is a day away from being over. I feel like since having kids, time goes by at a different pace than before. People would tell me when I was pregnant with my first, my daughter, to cherish the moments because before I’ll know it, time will fly by. Back then, I thought it was just hogwash and would just smile and nod. But whoa! It’s true! 3. May: This was my last month of work. 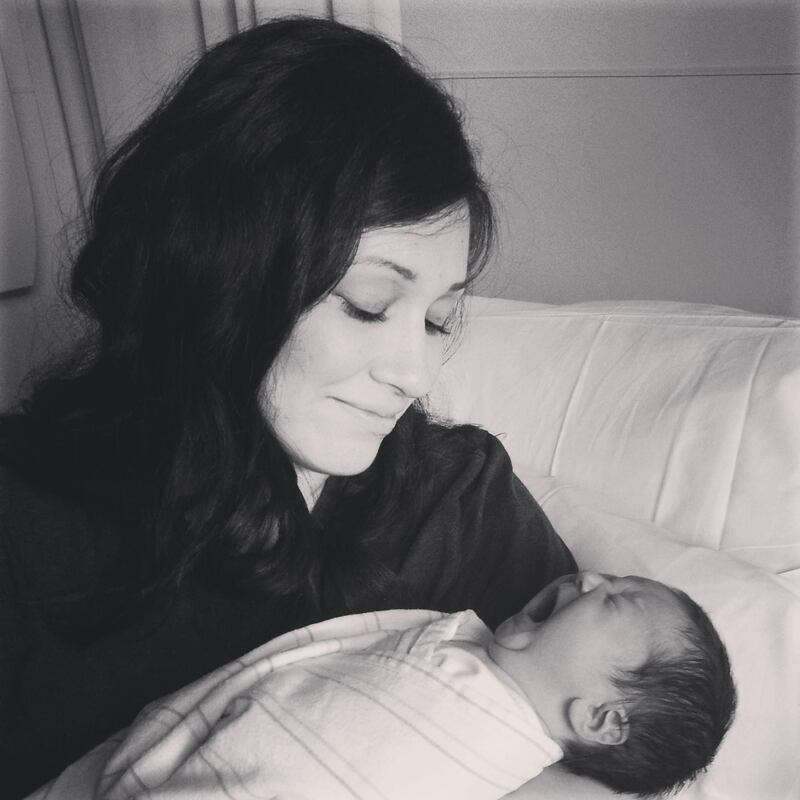 It was a super hard decision to leave my job and become a stay-at-home-mom. There are times that I still wonder if I did the right thing. I love being with my kids and sharing special moments with them, but I also miss my other kids. I miss reading literature and teaching writing and listening to my students’ stories. I miss my co-workers and the knowledge they shared with me. There is a possibility of me returning this fall; I have yet to decide on what I’ll do. 4. 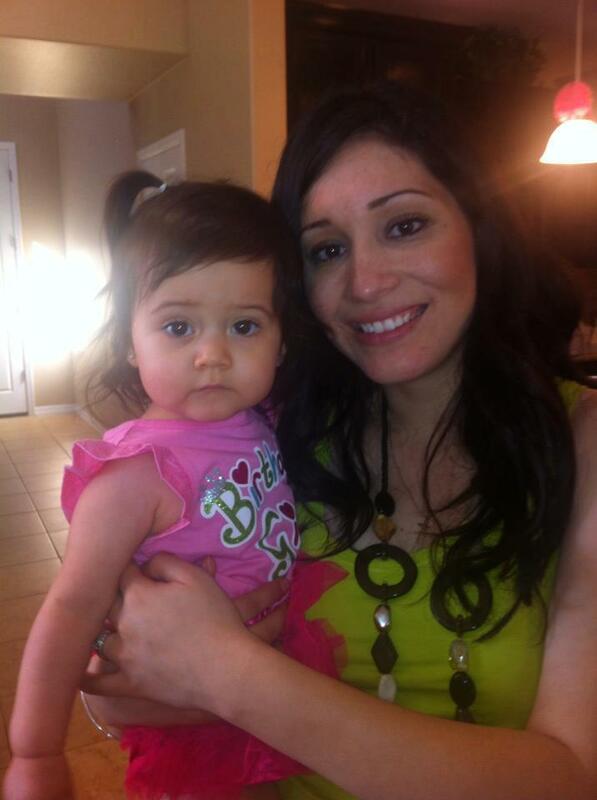 July: Helping to start and being a part a Healthy Moms group has been such a rewarding experience. Every day I post a Daily Check-in with a pump up song where moms check in with their workouts. I love reading what the women are doing and seeing their accomplishments. So many have said that the group has inspired them to change their lives and being even a small part of that gives me chills. I may never meet any of them, but knowing I’m remotely a part of their change makes me so happy. 5. July: Oh my goodness, my son was born this month. Throughout my entire pregnancy, I called my son a chill dude and that’s exactly what he is. He is such a good baby. He’s happy wherever he’s at and whatever he’s doing. He’s just cool. Seeing him and holding him, I knew our family was complete. We have our beautiful daughter and now our son, we couldn’t be more blessed. 6. September: Having been pregnant for what seemed like two straight years (my kids are 16 months apart), I was extremely antsy to get back on the workout field. 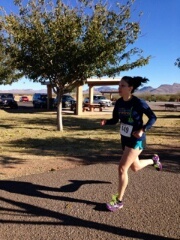 At 3 weeks post-partum, I began going to hot yoga and at 6 weeks post baby, I ran my first 5k! It was a slow one, but it felt oh so good! 7. October: I’ve mentioned in previous posts that I’m pretty obsessed with my husband. I won the lottery with this guy. Our anniversary is in this month and every year we try and do something fun and memorable. Last year, we ran the Bisbee 1000 and this year we took an amazing mini vacation to San Francisco. Any time I think of this trip, I smile. This trip was absolute perfection. Seriously, I could not name or think of one negative thing. It was just perfect. 9. December: This was a busy month for me running wise. 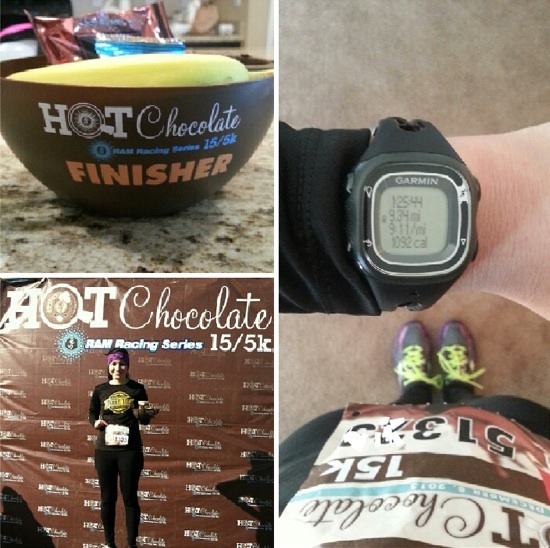 I ran the Hot Chocolate 15K early December and was just blown away. I honestly think back at this race and can’t believer that I actually did so well. 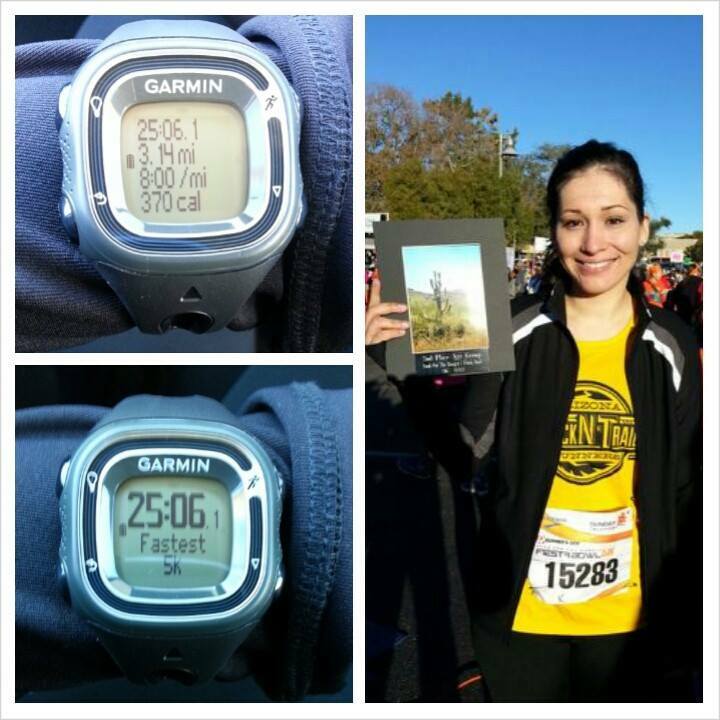 My goal had been to finish in under 1:30 and my final time was 1:25 with a 9:11min/mile pace. !!!! 11. Christmas this year was so special because it was our first Christmas in our own home. We chose not to travel this year and I’m so glad we didn’t. It was truly something special waking up and seeing my daughter’s eyes light up seeing the gifts under the tree—how did those get there!?! 12. I had a goal to run 5 races, one for each month of my son’s age at the end of the year : ), and I was able to complete that with 3 5Ks, 1 10K, and 1 15K. Of course another goal was to lose as much baby weight as I could and with the year closing, I am very happy to announce I’m 7 pounds away from pre PRE pregnancy weight! 13. Finally, a highlight of my year has been “meeting” so many people through this blog and other social mediums related to my blog. I was so nervous about starting this but I’m so glad I did. I truly am thankful to my sole sister Salt, as she gave me the push I needed to get started and is a patient helping hand whenever I need it. —Tell me about your 2013 highlights!!! I’d love to hear them !! I gave a my mini re-cap of my runs Sunday-Thursday in my blog link up with Salt, so I’ll update you on my Friday and Saturday run. Friday, I stuck to my easy one mile streak run. If you remember from my Streak Re-cap post, I had been sticking to only a mile this week to rest my leg. I definitely feel that with only running a mile and continuing to stretch and ice, that is has done a lot of good. My training plan had me running 12 miles on Saturday but I decided to do 10 again. I had plans to do two runs, one with my run club and another with some fellow Swirlgear girls (<—re-cap on that soon!). So, I decided to run 6 with my club group and then 4 with my Swirl girls. The 6 miler felt great! I was worried that after not having ran farther than a mile that I’d be a little rusty but I felt good the entire way. Each mile was faster than the previous and I ended up with a 9:34 avg. I am veeery happy with that! My second run was with my Swirl sisters and we took it easy. I’m glad we did as I didn’t want to push it with my leg. We started the first two miles at a jog and then walked/jogged the last two. It was a great easy run after my previous six miles. All in all, this week’s total mileage was: 14.8 miles, my lowest mileage to date but I’m glad I took some time to rest. –What are you New Year’s plans?